1 CONSOLIDATION: LIFE INSURANCE COMPANIES MODIFICATION OF TAX COST SETTING RULES ON LEAVING A CONSOLIDATED GROUP PURPOSE 1. The special tax cost setting rules that apply to life insurance companies that join a consolidated group 1 will be extended so that they also apply to life insurance companies that leave a consolidated group. BACKGROUND 2. 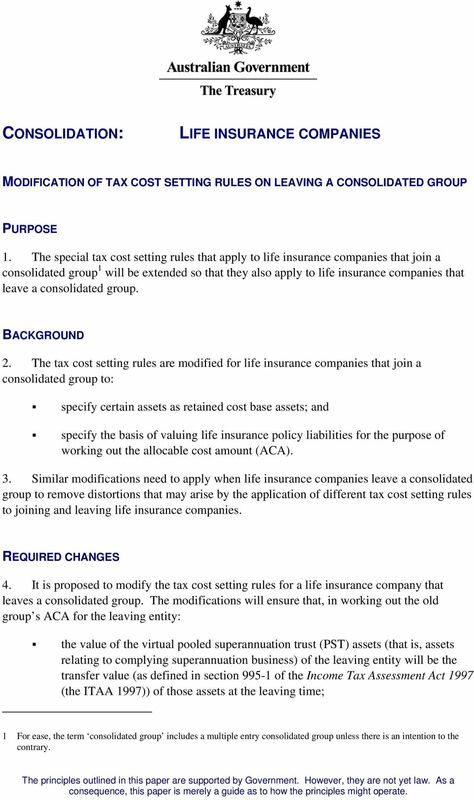 The tax cost setting rules are modified for life insurance companies that join a consolidated group to: specify certain assets as retained cost base assets; and specify the basis of valuing life insurance policy liabilities for the purpose of working out the allocable cost amount (ACA). 3. Similar modifications need to apply when life insurance companies leave a consolidated group to remove distortions that may arise by the application of different tax cost setting rules to joining and leaving life insurance companies. REQUIRED CHANGES 4. It is proposed to modify the tax cost setting rules for a life insurance company that leaves a consolidated group. The modifications will ensure that, in working out the old group s ACA for the leaving entity: the value of the virtual pooled superannuation trust (PST) assets (that is, assets relating to complying superannuation business) of the leaving entity will be the transfer value (as defined in section of the Income Tax Assessment Act 1997 (the ITAA 1997)) of those assets at the leaving time; 1 For ease, the term consolidated group includes a multiple entry consolidated group unless there is an intention to the contrary. The principles outlined in this paper are supported by Government. However, they are not yet law. As a consequence, this paper is merely a guide as to how the principles might operate. 2 2 the value of the segregated exempt assets (that is, assets relating to immediate annuity business) of the leaving entity will be the transfer value of those assets at the leaving time; and the value of assets held to support the net investment component of ordinary life insurance policies (other than policies that provide for participating benefits or discretionary benefits under life insurance business carried on in Australia) of the leaving entity will be the transfer value of those assets at the leaving time. 5. In addition, for the purpose of working out the old group s ACA for the leaving entity, the basis of valuing certain liabilities will be the same as the basis that is used when a life insurance company joins a consolidated group. That is: the value of the virtual PST liabilities of the leaving entity will be the amount worked out under section of the ITAA 1997 at the leaving time; the value of the exempt life insurance policy liabilities of the leaving entity will be the amount worked out under section of the ITAA 1997 at the leaving time; the value of liabilities under the net investment component of ordinary life insurance policies will be the amount worked out under section of the ITAA 1997 as if those liabilities were virtual PST liabilities at the leaving time; and the value of liabilities under the net risk component of life insurance policies will be based on the current termination value of that component of those policies at the leaving time. COMPLYING SUPERANNUATION CLASS LOSSES HELD AT THE JOINING TIME PURPOSE 6. The complying superannuation class losses of a joining entity that is a life insurance company will not be a sort of loss for consolidation purposes. BACKGROUND Complying superannuation class losses held at the joining time 7. The taxable income of life insurance companies is divided into the complying superannuation class (which is taxed at a rate of 15 per cent) and the ordinary class (which is taxed at a rate of 30 per cent). 3 3 8. Life insurance companies are required to segregate assets (virtual PST assets) that support complying superannuation policies. Valuation mechanisms ensure that the value of assets segregated does not exceed the value of the relevant policy liabilities (virtual PST policy liabilities). 9. Income derived on virtual PST assets is included in the complying superannuation class of taxable income. Losses on the virtual PST assets (virtual PST losses or complying superannuation class losses) are effectively quarantined so that they can only be applied against the complying superannuation class of taxable income. 10. When a life insurance company joins a consolidated group, the company must balance the value of its virtual PST assets and virtual PST policy liabilities. The tax cost setting rules are modified to, among other things: specify that virtual PST assets are retained cost base assets; and specify the basis of valuing virtual PST policy liabilities. 11. A tax loss held by a joining entity can be transferred to the head company only if certain tests are satisfied. These tests, which apply to sorts of losses, broadly ensure that losses can be transferred to the head company only if the joining entity could have deducted or applied those losses in the period immediately before the transfer assuming it had sufficient income or gains of the relevant kind. 12. The complying superannuation class losses of a life insurance company are effectively quarantined. Therefore, the tests that apply to sorts of losses held by a joining entity at the joining time should not apply to the complying superannuation class losses of a life insurance company. This is consistent with the principle that complying superannuation class losses essentially belong to virtual PST policyholders. Step 5 of the ACA 13. 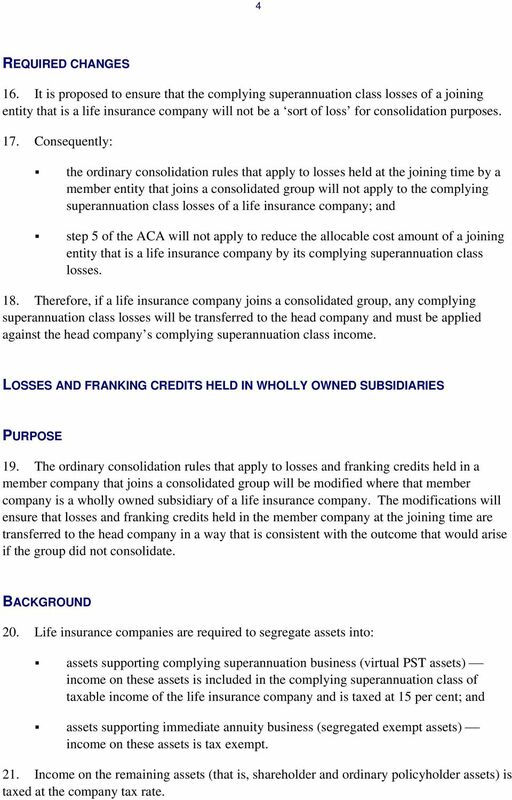 A consolidated group s ACA for a joining entity consists, broadly, of the group s cost of acquiring the membership interests in the joining entity and the amount of liabilities of the joining entity at the joining time reduced by, among other things, sorts of losses accruing to the joined group before the joining time (the step 5 reduction). 14. The purpose of the step 5 reduction is to prevent a double benefit arising from losses. Without the step 5 reduction, a double benefit can arise because the losses could be claimed as a tax deduction against future income and would be reflected in the ACA to reset cost base assets. 15. 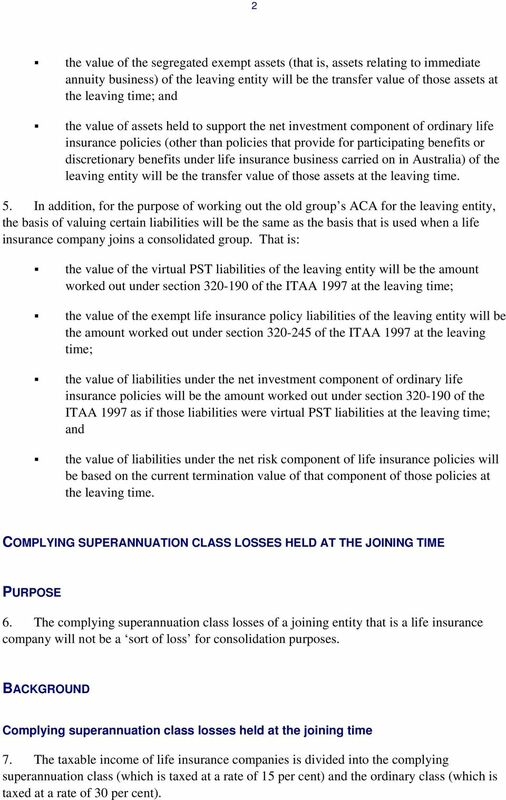 The step 5 reduction should not apply to reduce the ACA of a joining entity that is a life insurance company by the amount of its complying superannuation class losses. 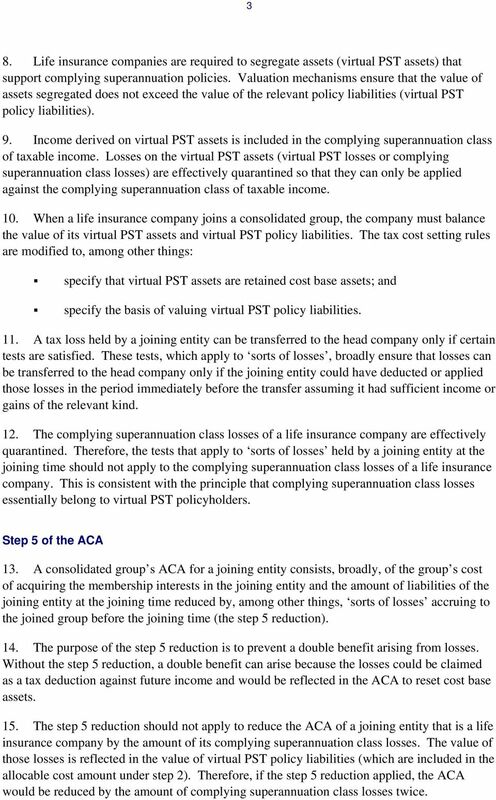 The value of those losses is reflected in the value of virtual PST policy liabilities (which are included in the allocable cost amount under step 2). Therefore, if the step 5 reduction applied, the ACA would be reduced by the amount of complying superannuation class losses twice. 4 4 REQUIRED CHANGES 16. It is proposed to ensure that the complying superannuation class losses of a joining entity that is a life insurance company will not be a sort of loss for consolidation purposes. 17. Consequently: the ordinary consolidation rules that apply to losses held at the joining time by a member entity that joins a consolidated group will not apply to the complying superannuation class losses of a life insurance company; and step 5 of the ACA will not apply to reduce the allocable cost amount of a joining entity that is a life insurance company by its complying superannuation class losses. 18. Therefore, if a life insurance company joins a consolidated group, any complying superannuation class losses will be transferred to the head company and must be applied against the head company s complying superannuation class income. LOSSES AND FRANKING CREDITS HELD IN WHOLLY OWNED SUBSIDIARIES PURPOSE 19. The ordinary consolidation rules that apply to losses and franking credits held in a member company that joins a consolidated group will be modified where that member company is a wholly owned subsidiary of a life insurance company. The modifications will ensure that losses and franking credits held in the member company at the joining time are transferred to the head company in a way that is consistent with the outcome that would arise if the group did not consolidate. BACKGROUND 20. Life insurance companies are required to segregate assets into: assets supporting complying superannuation business (virtual PST assets) income on these assets is included in the complying superannuation class of taxable income of the life insurance company and is taxed at 15 per cent; and assets supporting immediate annuity business (segregated exempt assets) income on these assets is tax exempt. 21. Income on the remaining assets (that is, shareholder and ordinary policyholder assets) is taxed at the company tax rate. 5 5 22. The consolidation membership rules are modified for consolidated groups that include life insurance company members so that wholly owned subsidiaries of life insurance companies are members of the group only if: all of the membership interests are ordinary assets; all of the membership interests are virtual PST assets; or all of the membership interests are segregated exempt assets. 23. The ordinary treatment of losses and franking credits held by a member company that is a wholly owned subsidiary of a life insurance company on joining a consolidated group would result in tax benefits being taken away from policyholders. As a consequence, the life insurance company would need to compensate policyholders for the loss of those tax benefits. 24. In the case of losses, subject to appropriate integrity rules, the ordinary consolidation rules result in any unutilised losses of member companies being transferred to the head company. If losses held at the joining time by a member company that is a wholly owned subsidiary of a life insurance company are transferred to the head company, the benefit of those losses will, to some extent, be effectively transferred from the policyholders of the life insurance company to the shareholders. 25. 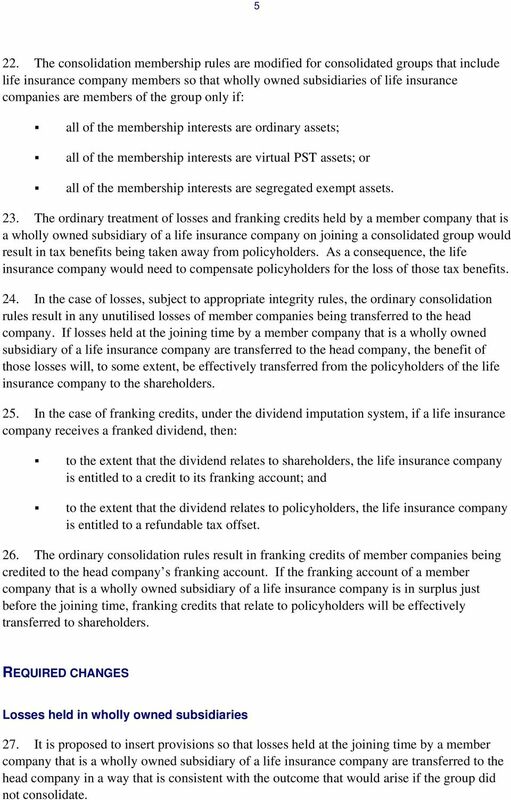 In the case of franking credits, under the dividend imputation system, if a life insurance company receives a franked dividend, then: to the extent that the dividend relates to shareholders, the life insurance company is entitled to a credit to its franking account; and to the extent that the dividend relates to policyholders, the life insurance company is entitled to a refundable tax offset. 26. The ordinary consolidation rules result in franking credits of member companies being credited to the head company s franking account. If the franking account of a member company that is a wholly owned subsidiary of a life insurance company is in surplus just before the joining time, franking credits that relate to policyholders will be effectively transferred to shareholders. REQUIRED CHANGES Losses held in wholly owned subsidiaries 27. 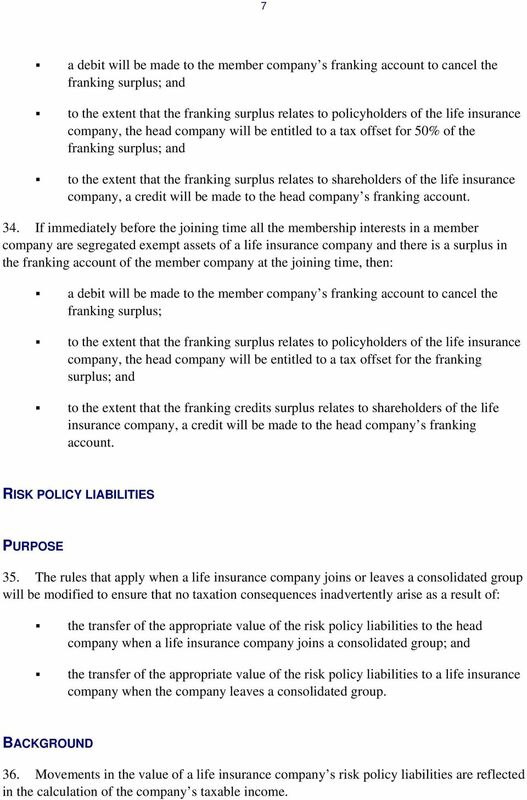 It is proposed to insert provisions so that losses held at the joining time by a member company that is a wholly owned subsidiary of a life insurance company are transferred to the head company in a way that is consistent with the outcome that would arise if the group did not consolidate. 7 7 a debit will be made to the member company s franking account to cancel the franking surplus; and to the extent that the franking surplus relates to policyholders of the life insurance company, the head company will be entitled to a tax offset for 50% of the franking surplus; and to the extent that the franking surplus relates to shareholders of the life insurance company, a credit will be made to the head company s franking account. 34. 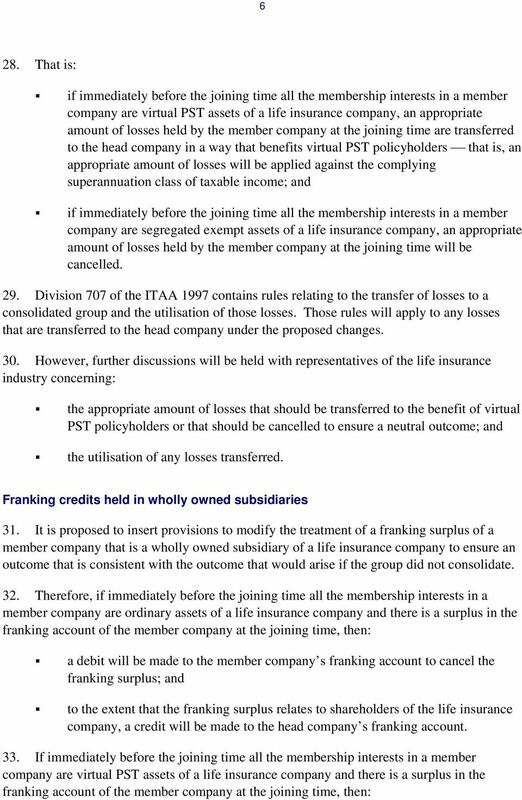 If immediately before the joining time all the membership interests in a member company are segregated exempt assets of a life insurance company and there is a surplus in the franking account of the member company at the joining time, then: a debit will be made to the member company s franking account to cancel the franking surplus; to the extent that the franking surplus relates to policyholders of the life insurance company, the head company will be entitled to a tax offset for the franking surplus; and to the extent that the franking credits surplus relates to shareholders of the life insurance company, a credit will be made to the head company s franking account. RISK POLICY LIABILITIES PURPOSE 35. The rules that apply when a life insurance company joins or leaves a consolidated group will be modified to ensure that no taxation consequences inadvertently arise as a result of: the transfer of the appropriate value of the risk policy liabilities to the head company when a life insurance company joins a consolidated group; and the transfer of the appropriate value of the risk policy liabilities to a life insurance company when the company leaves a consolidated group. BACKGROUND 36. Movements in the value of a life insurance company s risk policy liabilities are reflected in the calculation of the company s taxable income. 8 8 37. The company must compare the value of its risk policy liabilities at the end of an income year with the value of those liabilities at the end of the previous income year. Increases in the value of the risk policy liabilities over the income year are allowable deductions. Decreases in the value of the risk policy liabilities over the income year are included in assessable income. 38. Concerns have been raised that movements in the value of the risk policy liabilities caused by a life insurance company joining or leaving a consolidated group may result in distortions in the calculation of the taxable income of the life insurance company and/or the head company. REQUIRED CHANGES 39. It is proposed to ensure that, when a life insurance company joins a consolidated group, the opening value of the head company s risk policy liabilities reflects the life insurance company s value of those liabilities immediately prior to joining the consolidated group. 40. 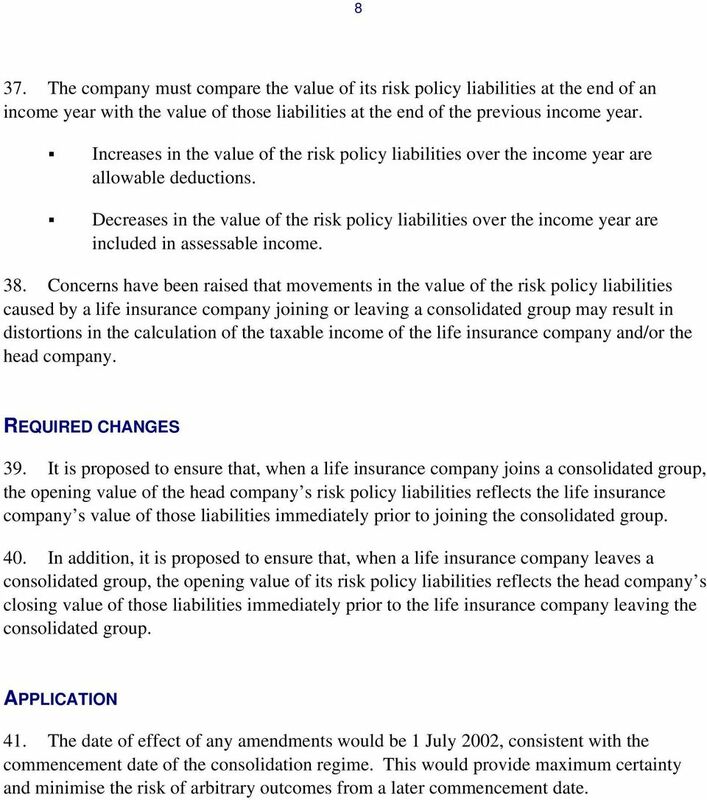 In addition, it is proposed to ensure that, when a life insurance company leaves a consolidated group, the opening value of its risk policy liabilities reflects the head company s closing value of those liabilities immediately prior to the life insurance company leaving the consolidated group. APPLICATION 41. The date of effect of any amendments would be 1 July 2002, consistent with the commencement date of the consolidation regime. This would provide maximum certainty and minimise the risk of arbitrary outcomes from a later commencement date. EXPLANATORY STATEMENT. STATUTORY RULES 2010 No. Australian Accounting Standards Board. Proposed Agenda Rejection Statement. Recognition of Franked Dividend Revenue. Malaysia. A company authorised under the Malaysian Insurance Act to carry out all insurance business other than life business. On the following pages we have addressed the specific issues that arise from the paper. TAX BRIEFING SPANISH TAX REFORM: MAIN ISSUES FOR M&A AND FINANCING TRANSACTIONS DECEMBER 2014 THIS BRIEFING FOCUSES ON THOSE MEASURES INCLUDED IN THE CIT ACT WHICH AFFECT M&A, FINANCING & REFINANCING TRANSACTIONS. Property and casualty insurance companies are those that insure the assets of the insured party. Investing in Asia Pacific 2015: Australia Australia China Hong Kong India Indonesia Japan Korea Malaysia Singapore Taiwan Thailand Vietnam Audit Tax Advisory All lasting business is built on friendship. SRF 330.0 must be completed for each RSE, defined benefit RSE, pooled superannuation trust (PST) and eligible rollover fund (ERF).